I want to thank Katherine Tegen Books (Harper Teen) and Edelweiss for providing me with an ARC of this book to read and give an honest review. Receiving this book for free has in no way altered my opinion or review of this book. First I have to say that just by looking at the cover of this book I wanted to read it! The colors, the way the girl is presented and just the overall feel really drew me into it. And since I have been on a bit of a sci-fi roll, I was ready to jump into this technology driven story for sure! Regan is a great character. She's truly strong and snarky. I love how she's not afraid to do things, try things, find out why things are the way they are. Things don't seem to scare her as they should. Whether or not that's good or bad, well, I'll leave that to you to find out. She definitely stands up for what she believes in. And she doesn't like to go with the norm, she'd rather go against the grain and be her own person, even if it does make her a bit of an outcast. She extremely dedicated to finding the truth, and not necessarily believing what others tell her just because they think she should. Josh and Patrick create a bit of a love triangle in the book. Pat is Regan's long time best friend. And, while she finds herself attacked to him, she also sees that a relationship between them might be a bit awkward. But is this how Pat feels? And I didn't know if Pat was trustworthy or not. He's a boy genius, running a company at the tender age of 18. But are there secrets that he's keeping? or secrets that are actually being kept from him? Josh, on the other hand, is someone new and intriguing. He's a bit dark and mysterious, and I wasn't sure if I could trust him in the story. He is an old friend of Patrick's, one who lost touch with him when an incident happened to send him off to military school. But now Josh is back, and he has a bone to pick with Orexis and their Elusion program. So is he in it for revenge or does he have some other agenda in mind? The characters in the book are developed well and realistic. I was able to relate to them and felt a true connection with Regan. The world building was a split for me with this one. When the characters are in Elusion and it's described I was totally immersed and able to picture what was going on. I understand what this alternate reality gave to the user and how it could become something the user might not be able to stay away from. And the technology behind it was described well, as is the creation of the program. The world building in regards to where Regan and her friends and family live is not so great. I have no idea why Detroit has become the way it is. The city is overrun with poor air quality, a testament, perhaps, to all the factories that are currently there now. But it is never explained how and why the air quality became so poor, or when this happened. And there are many technologies the residents of the city use which are not fully explained as well. I am also a bit baffled as to what is going on in other parts of the country and world. So I felt I bit in the dark and like perhaps this needed to be addressed a bit better. The plot is really great. There are many twists and turns the reader will not see coming. There's a ton of mystery and even up until the end I wasn't sure who I could and could not trust. The authors did introduce romance, and a bit of a love triangle (which actually seemed more one sided than anything else). But the romance wasn't what pulled the story along, it was the mystery of what went on when the user went inside the Elusion program and what was going on with those who seemed to be addicted to the program that really kept me in the story. I enjoyed the writing in this book. It was clean and clear and not full of information dumps. I was never bored, wanting to put the book down and come back at a different time when I thought I might be more into it. The mystery and suspense keep me intrigued and wanting more. And the authors decided to end the book on a bit of a cliffhanger, which has me wanting book #2 before the first book has even been published! 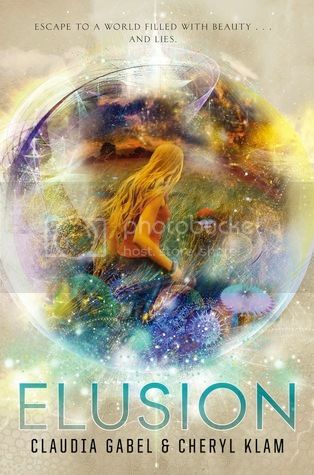 Readers who enjoy sci-fi with mystery and thrillers thrown on top of some action and adventure, will love this first installment of the Elusion series. I would recommend this read for sure! I can’t really remember a time when I didn’t love books. In fact, my mom has told me over and over again that I taught myself how to read when I was three. While I always found that a little hard to believe (mothers tend to exaggerate on occasion, especially when it comes to their kids’ accomplishments), she swears it's true. Looking back, I think what appealed to me most about books was how a story could instantly transport me to another world and set me out on an adventure, whether it was floating around the universe with Meg in A Wrinkle in Time, or floating down a river with Huck Finn and Jim. I also loved how portable books were—I could open up a paperback on the bus to school, or in a park, or in my room, or in the car on the way to my grandparent’s house—so no matter where I was, I had the ability to completely disappear. Honestly, reading made me feel like I had this incredible super power, and it still does to this day. If my high school journals could talk! From then on, I wrote stories in notebooks, moving on from three-subject to five-subject sized when I was in eighth grade. I’d mostly write in the summers and give the stories to my friends to read, hoping they’d like the pre-teen love triangles I cooked up. Sometimes my friends would read the books while they were in progress and give me advice on where they thought the story should go. I also loved to write poetry, too, which I kept a lot more private, kind of like a diary. When I went to high school, I joined any activity group involving writing, including the newspaper, which I co-edited for three years, starting as a sophomore. I tried getting into creative writing programs when I applied to college, but wasn’t accepted—a heartbreaking experience that had me doubting whether or not I had the talent to even be a good writer. I wound up in a traditional English program instead, and for a while, I forgot about pursuing my writing in any serious way. It’s just a hobby, I told myself, so in college I did some poetry slams and thought that would be the extent of it. But then I went on to graduate school, where I was considering a career in academia, and something shifted back into place. While I was toiling away on term papers that had names like “Demystifying the Mneumonics in Milton’sParadise Lost,” (um….what?) I got a job working as an editorial assistant at a publishing house in New York City. I don’t mean to sound overly dramatic, but it was life changing—I saw that there was another way I could be a part of the world of books. If I couldn’t get my own work published (or if it wasn’t worthy of being published to begin with), then I could help someone else make his or her dream of becoming an author come true, and do everything I could to give them the right editorial guidance. I’ll never forget the first time I called a writer to say I wanted to acquire his novel—he thought it was a prank! Thanks! This love triangle is a little weird. One of the guys is just a friend, so she's not so sure about him. There's a lot of lies and deceit that she has to swim through to see what's truly real. I hope you enjoy it!